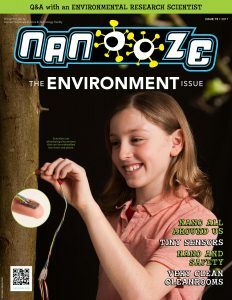 Issue 15: The Environment | Nanooze! 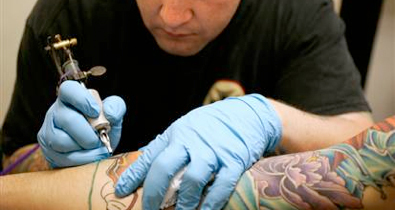 Issue #15, “The Environment” Nanotechnology is a new field of science that lets us do things at the atomic scale. We can build stuff from the ground up, one atom at a time. It isn’t really a “new” science, just new to us—there has been nanometer-sized stuff around since the beginning. 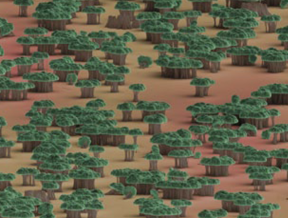 Our environment is full of nanometer-sized things, from tiny dust particles to stained glass to nanoparticles of rare materials thrown up into the atmosphere by volcanoes. There is new concern about nanomaterials in the environment and how they might impact our health and the health of the planet. How nanomaterials impact the environment is a complicated question, because some materials are man-made, while others occur naturally. Things like asbestos, which was once an important insulator used on things like steam pipes, are now known to cause serious diseases. This issue is all about nanomaterials in the environment, where they are found and how we can also use nanotechnology to find them.